We're delighted to announce that the last Little Tern egg has hatched. 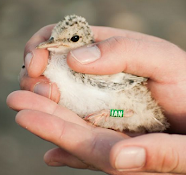 111 Little Tern pairs successfully hatched young this year, more than any other year since the project began. We have a total of 213 chicks, most of which have fledged. Little Tern numbers in the colony are noticeably smaller as they start to leave the colony so the season is well and truly winding down. The only small concern we have is a Peregrine Falcon that pays the colony a visit every other day, we've seen it take at least 3 birds this year but given how quick they are the number is likely to be higher. However we are not too worried as they do not take many and it would be foolish to think that we can protect every individual. The Otters have been ever present this year and we often watch them hunt and play from our caravans. 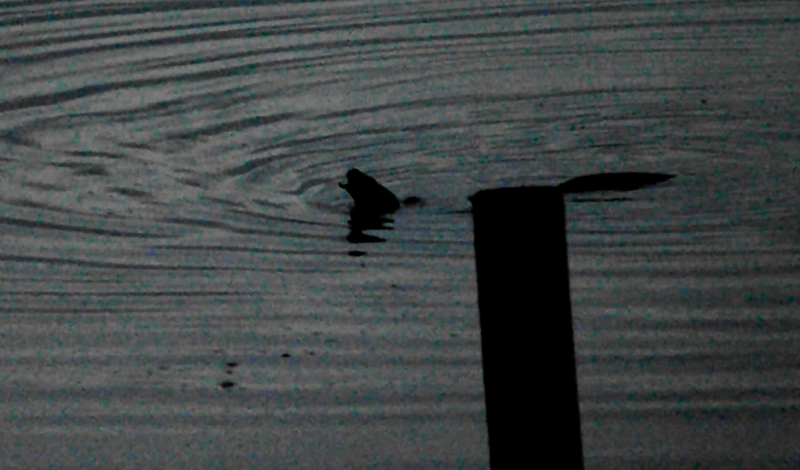 They seem to be particularly fond of crabs, munching loudly on them all night. Birds appear to be on the move now and we've had good numbers of Black-tailed Godwits, Curlew and Common Sandpipers show up in the lagoon. Willow Warblers can be seen passing through the Buckthorn and a pair of Wheatear were spotted in the colony yesterday. We were also lucky to see a Red Kite glide past the farmland last week. Yesterday our first Clouded Yellow of the year in Kilcoole made an appearance. Clouded Yellows are a migrant butterfly that comes all the way from Spain/North Africa. Some years they can be very scarce and some can be just the opposite, like the Waxwing, so here's hoping we have a good Clouded Yellow year. They are unmistakeable bright yellow butterflies that are a joy to see. In recent years in Kilcoole we leave a little joke around the colony. Last year we put a plastic owl on a fencepost near the caravans. It was almost heart breaking telling excited onlookers that it was plastic! One year on our species board we had Unicorn listed. To our surprise this did catch one person out! This year we went for a more subtle approach. On our species board we listed "Norwegian Blue Parrot (dead)". This was lost on most people and it didn't seem worth it. We had many people asking us where we saw it and how it got here. But it was all worthwhile (to me anyway) when I saw a couple of people delighted with themselves after getting the joke. After which the flood gates opened and more and more passers by gave me their approval. The parrot is a reference to the infamous Dead Parrot Sketch performed by the legendary Monty Python gang - https://www.youtube.com/watch?v=4vuW6tQ0218. And it wasn't dead, it was resting.